Have you ever dreamed of building a super awesome treehouse? Now it?s time to live that dream! In Best Treehouse Ever, players compete to build the best treehouse in the neighborhood. Players will outfit their treehouse with the coolest rooms, all while making sure their tree doesn't tip over?and that their rooms are the most impressive at the end of the game. Building takes place over three weeks/rounds, and at the end of the third week the winner will be the player with the best treehouse ever! It?s time to build another treehouse! In the new stand alone sequel Best Treehouse Ever: Forest of Fun, players compete to build their best treehouse, outfitting their treehouse with cool rooms, and creating fun habitats for their favorite furry and feathered friends, while also making sure that their tree doesn't tip over and that their rooms are more impressive than all of their friends' rooms at the end of the game. In addition, our treehouse builders have leveled up their experience by visiting new locations in the forest that provide special abilities to help them in their new build. Building takes place over three weeks/rounds, and in each round, players use card drafting and spatial reasoning to add five new rooms to their treehouse. Players must pay attention to the other treehouses being built since they take turns determining which types of rooms score for everyone at the end of each round. At the end of the third week, the winner is the player with the best treehouse ever! But the best part? 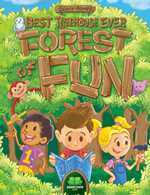 Best Treehouse Ever: Forest of Fun can be combined with Best Treehouse Ever to play up to 8 players!